Using menu commands and keyboard shortcuts in Photoshop Elements 11 enables you to travel back and forward in time to undo and redo edits using single menu choices or keyboard shortcuts for each undo/redo. The Undo History panel, on the other hand, displays a visual of your editing history where you can travel back and forward in time to change your edits with a complete list of the edits made on a photo shown in the panel. To open the Undo History panel, choose Window→Undo History. The Undo History panel opens. 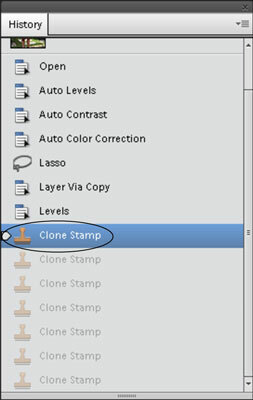 As you make edits on an image, each edit is shown in a list in the panel. The Undo History panel gives you a capability that menu commands don’t: You can target an Undo (or Redo) to go back (or forward) to a specific edit. 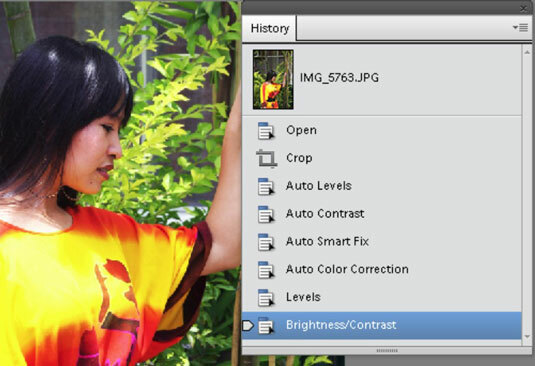 For example, if you create a selection, apply an enhancement edit (such as changing image brightness), and then apply a filter, you can return to the selection with one mouse click. Instead of choosing Undo to undo the filter and Undo again to undo the image brightness, you simply click the selection edit in the Undo History panel. The number of history states is determined in the Performance preferences. By default, you have 50 history states that appear in the Undo History panel. When you come to the 51st edit, the first edit in the sequence is deleted from the panel, and you can’t return to that state. As you make more new edits, you continually delete edits from the top of the panel. If you want to add more states to the Undo History panel, open the Performance preferences and change the value in the History States text box. As you increase history states in the Performance preferences, the amount of memory required by Elements is increased. You may find the program getting sluggish if you increase the History States significantly. To return to an earlier edit in the Undo History panel, find the item you want to return to in the list and click it. You can also apply a number of edits to create a selection and, after the selection is created, apply another series of edits to the selected area. If you want to return to the original selection, click the item in the Undo History panel. As long as the items remain in the list, you can click backward or forward to undo and redo edits. If you know that the edits following a particular edit are no longer needed, you can delete them from the list. To delete the last edit in the Undo History panel, click it in the list and then right-click to open a context menu. From the menu choices, choose Delete. The selected edit is deleted from the list. If you have a series of items you want to delete from the list, click the first item within a given list of edits to open a context menu. Then, when you choose Delete, all items in the list that follow the selected item are deleted. Keep in mind that all edits following an edit you target for deletion are deleted when you open a context menu and choose Delete. If you want to delete a series of edits that are followed by edits you want to retain, it’s a bit more complex: You have to delete the unwanted edits individually. Elements doesn’t give you the capability to select a group of edits and then delete the whole group at once. If you apply a number of edits and choose File→Save, the edits you made up to the time you save the file are kept and recorded as part of the new saved file. The Undo History panel maintains the list of edits applied to the document before you last saved it. Therefore, you can undo edits after saving a file as long as the file remains open. If you close the file and reopen it, the Undo History panel is cleared. You can also clear the Undo History panel after making edits by opening a context menu and choosing Clear History. The list is cleared and appears the same as when you first opened the file before you applied any edits.